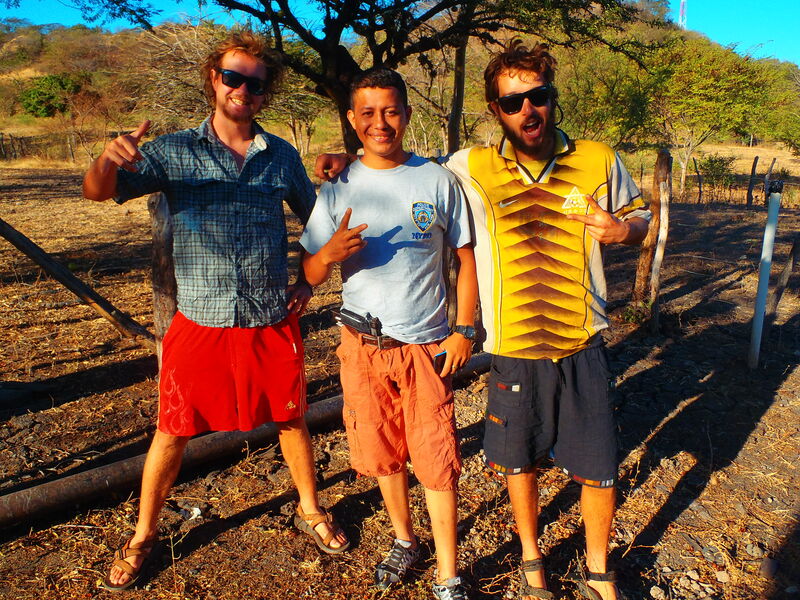 Climbing Acatenango, bustin through El Sal, Honduras, and Nicaragua is poppin off! We left off in Antigua. We were having a great time and it only got better. 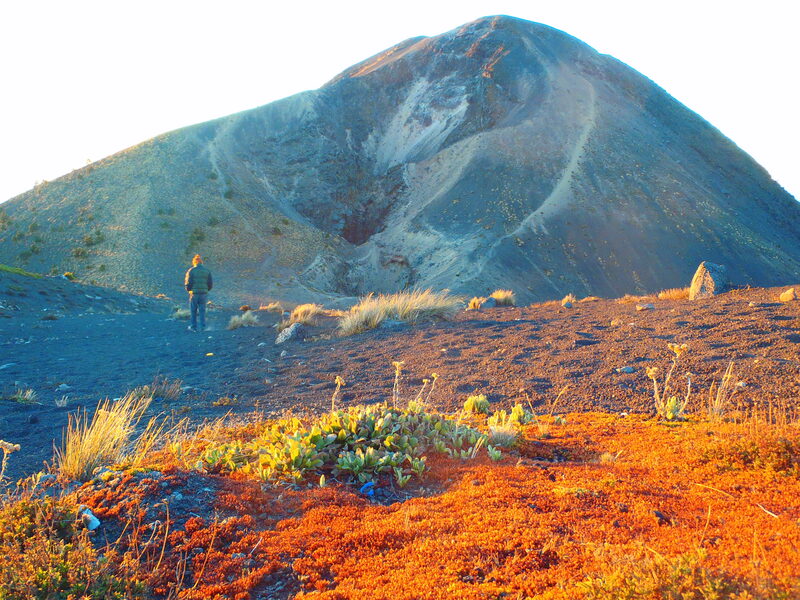 We had been trying to climb one of the surrounding volcanoes, but were put off by the heavy price tag that the local tourist guides were charging. So being natural resource recreation & tourism professionals ourselves, we decided we’d just have to do it ourselves. 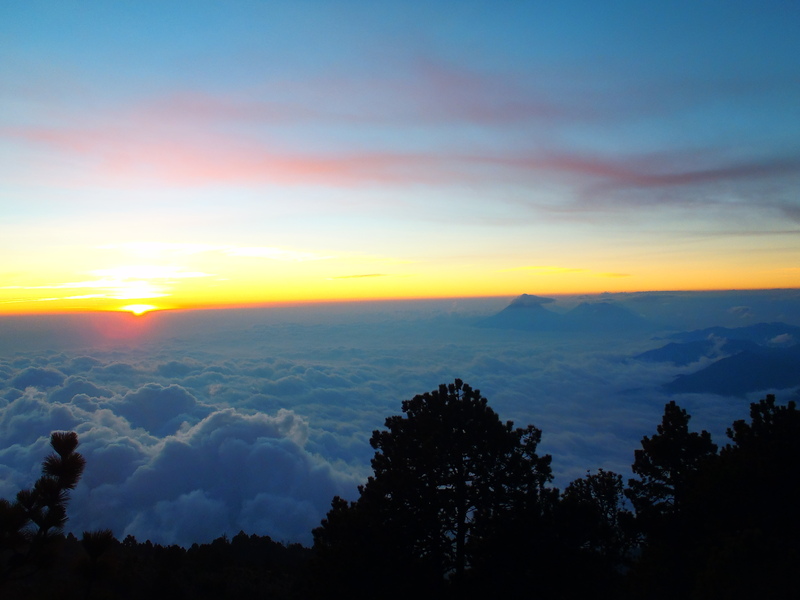 After talking to a handful of people we got the beta on how to climb the Volcan Acatenango. We left our bikes at Michaël and Chris’s house and loaded up our packs. 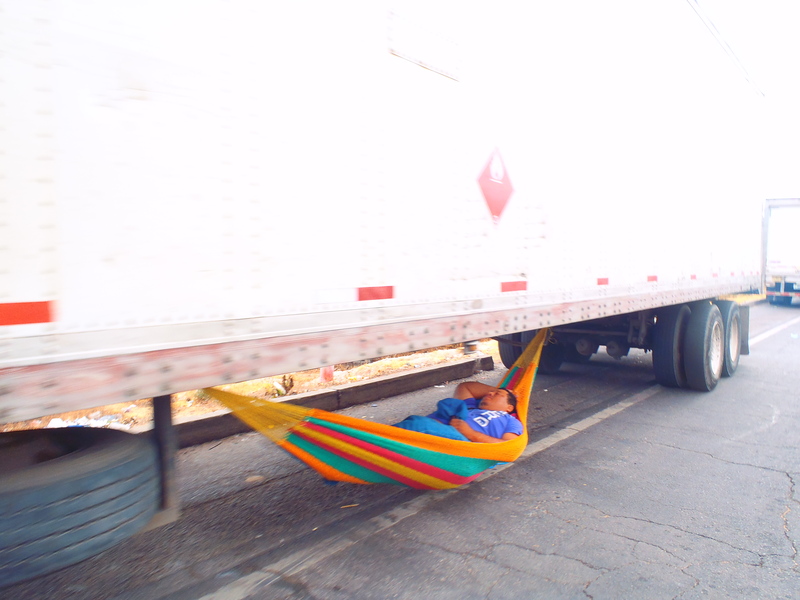 Right as we walked out the door we jumped on the back of a brick truck and hitched a ride out of town to Jocotenango. From Joco we took a few bus rides to the small mountain village of Soledad. 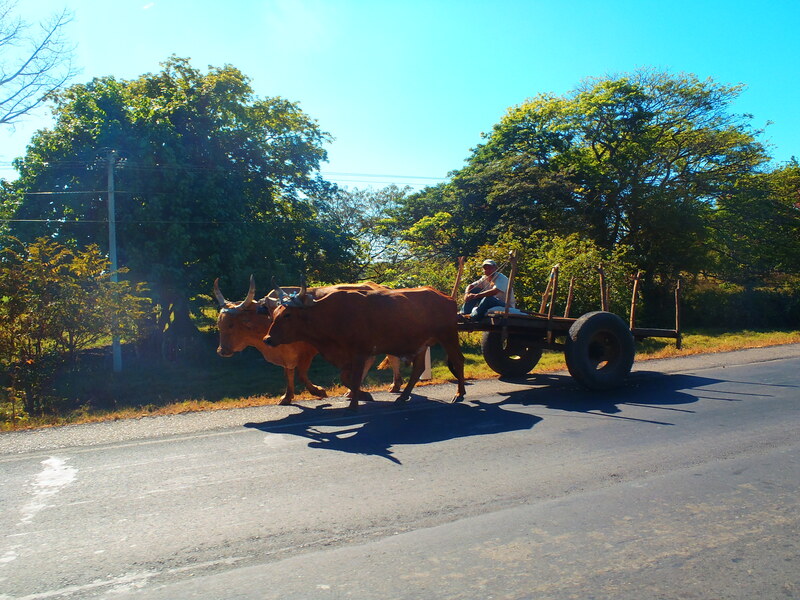 Once we got there we hired a local farmer to show us the way up the Volcano. It was really neat to go hiking instead of biking for a change. The trail started right out of the farmlands and elevated up to lush jungle ecosystems. 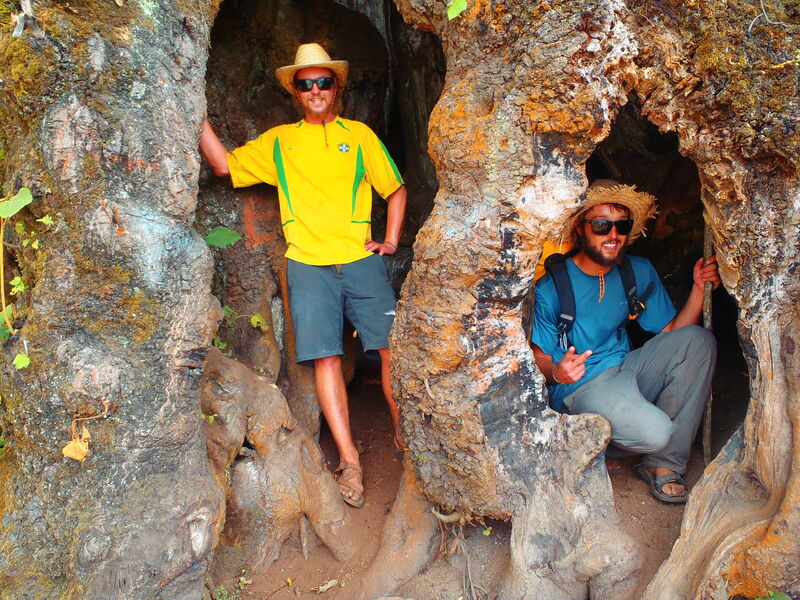 Chillin inside a 500 year old tree on the way up the volcano! 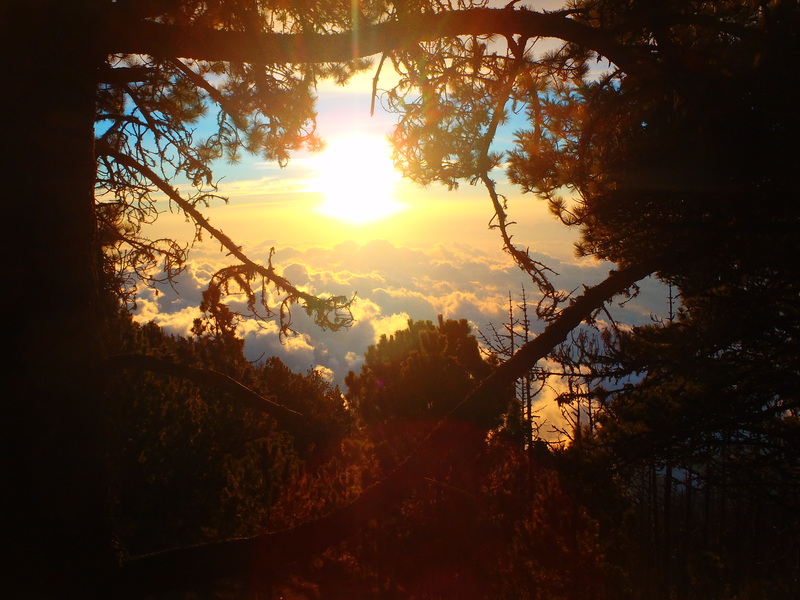 After scaling through the jungle on countless switchbacks above the clouds the environment turned into pine forests that reminded us of Colorado. Our guide Hector and his 10 year old son Hector Jr. returned down the mountain here to go home for the night. We continued up the trail towards the saddle. After the pine forest the topography morphed into volcanic tundra. 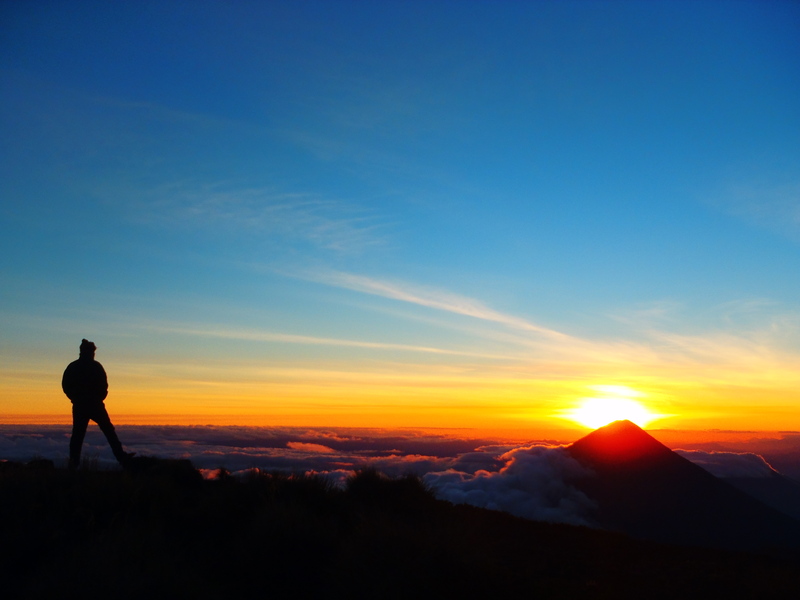 We set up camp in the saddle between the two volcanic summits and watched the sunset over the clouds! 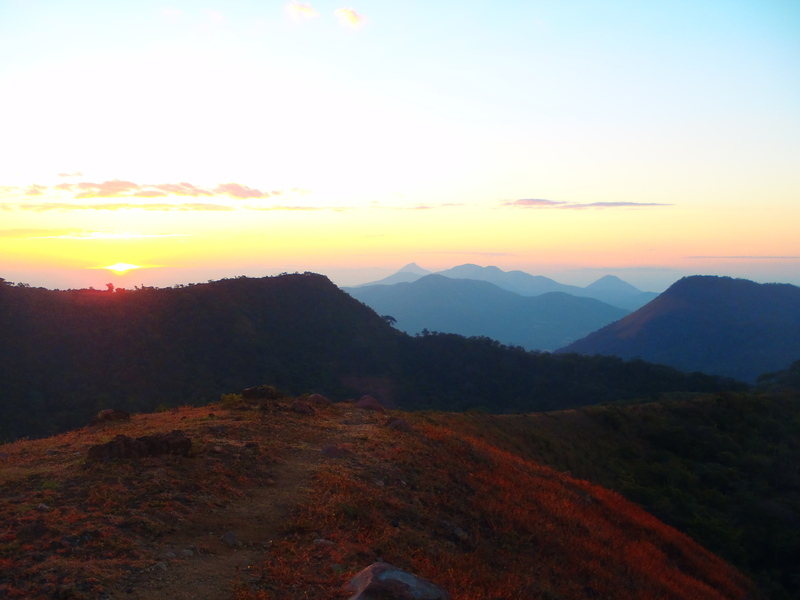 After eating some dinner and warming up we decided to push on to the summit of Acatenango. We took the path to the right which leads up the ridge. It was very steep on loose sand. It reminded us of the suffering involved with climbing a snow route. While resting on a boulder we vaguely remembered the farmers daughter who drew us a map telling us to take the left hand route not the right! Oh well. The chossy sand climbing turned into super exposed technical 5th class rock scrambling! This was super fun as we gnarvigated up the rocky ridge. There was the abyss to our right and the glimmering lights of Antigua shimmering in the distant valley floor down to our left. Feeling close to the summit we encountered some hot vents blasting out warm air. We warmed out hands here and pushed onwards! As we reached the summit out in the distance Volcan Fuego was erupting! We were mesmerized as we watched lava blasting 50 ft into the air and then smashing down the mountainside! We watched this phenomenon from the safety of Acatenango for about 30 minutes. We witnessed about 6 eruptions, it was amazing. The whole mountain would shake and sounded like thunder from inside the earth before it would blow. Its like the earth was puking! It shows you how alive the planet really is. After sippin on some rum from the flask to stay warm as we watched the fireworks it was time to descend back to camp. We ended up taking the easy route and hunkered down for a pretty cold night up there on the saddle. The next morning we were treated to an amazing sunrise! We were truly above the clouds on top of the world. Running low on supplies we descended the volcano after sunrise. It took about two hours to make the descent. 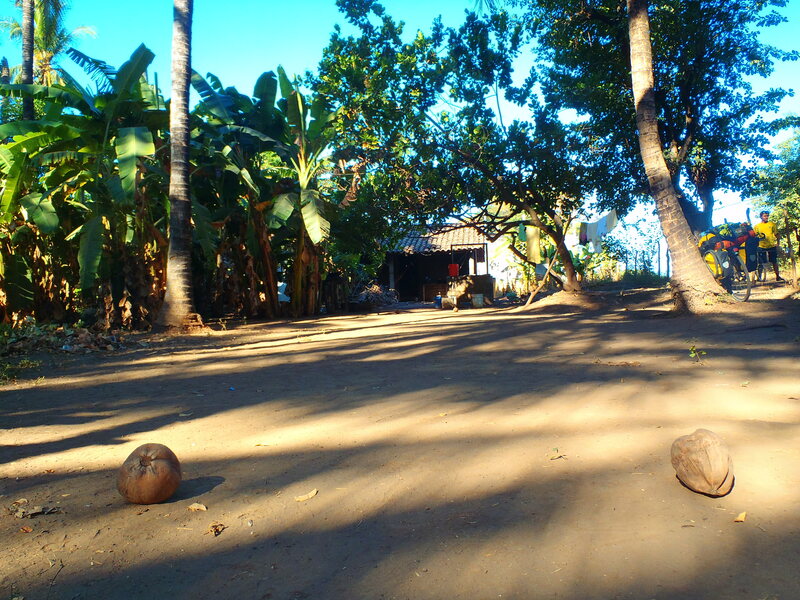 Once we got back to the village we hitchiked back to Antigua. We were walking back to the house and ran into our friend Sam who offered to buy us a beer at the Terrace! What a perfect way to end the expedition! 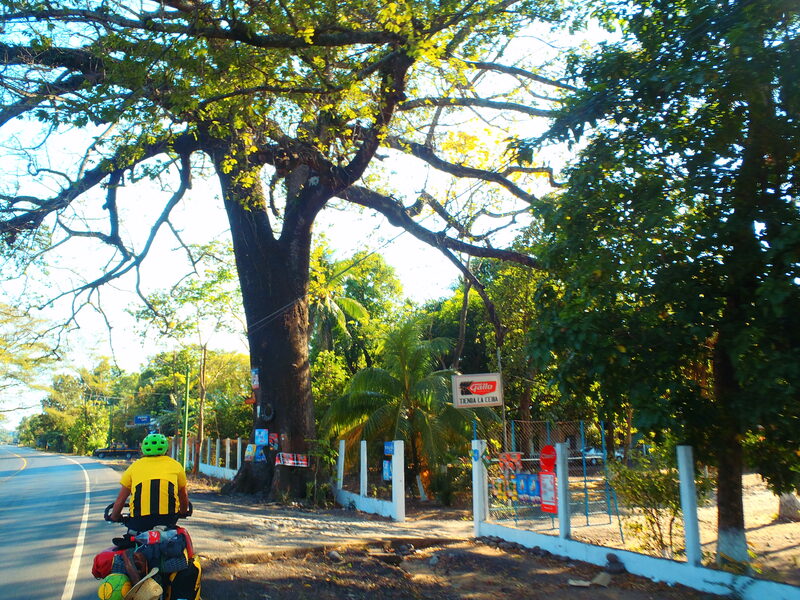 Leaving the bone rattling cobble stone streets of Antigua, we descended down, passing many Ceiba trees that shaded our way to El Salvador. 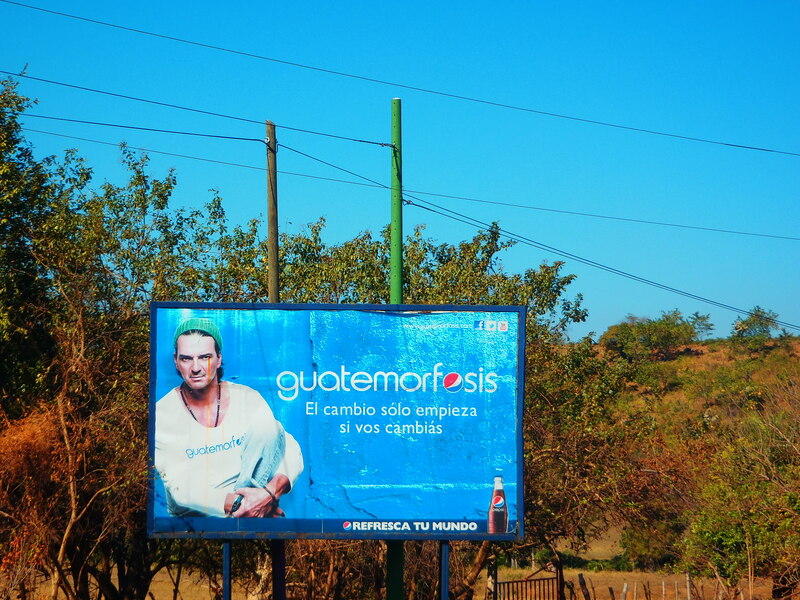 Finally exiting Guatemala after getting Guatemorfosized we were again en route for South America. We pushed into San Salvador, El Salvador just in time to catch the Denver Broncos get annihilated in the super bowl. 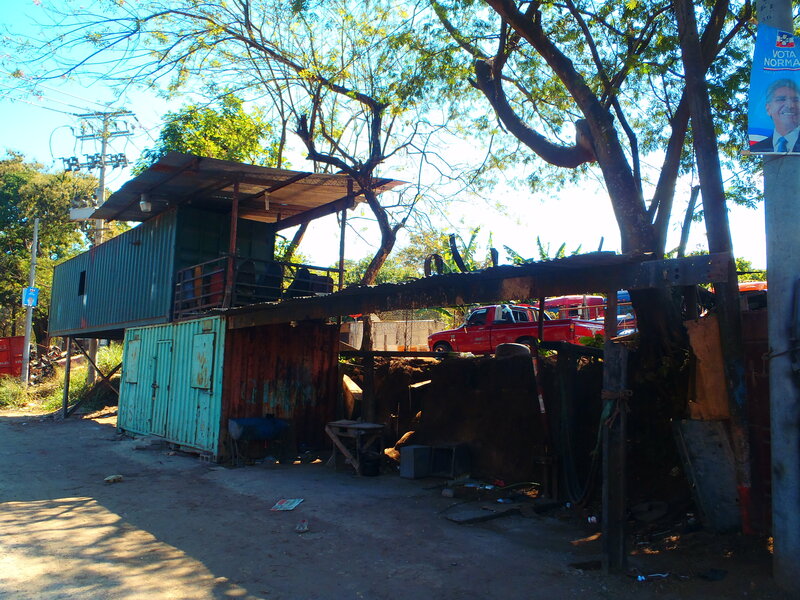 It was here where we were fortunate enough to stay with Giovanni and his family, who lived in a wealthier suburban of San Salvador. 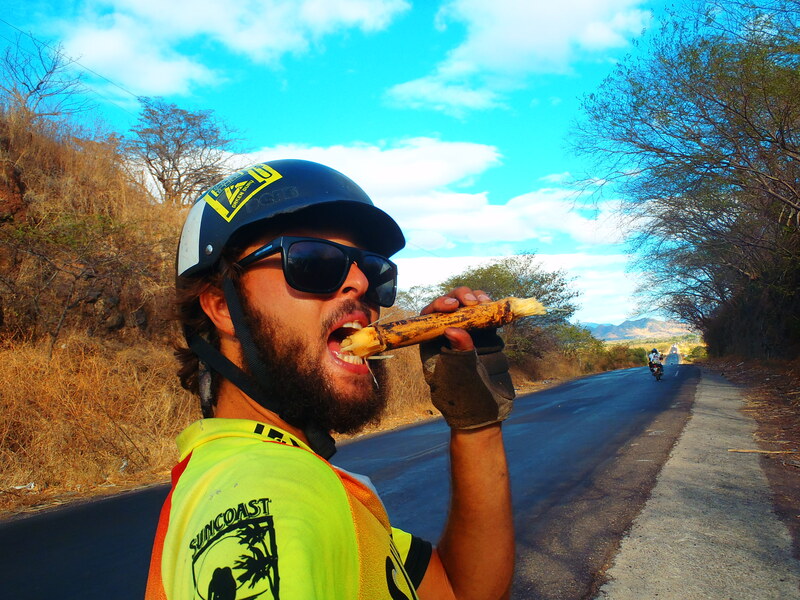 Giovanni bike toured from El Salvador to New York a few years ago and enjoys having cyclists stay with him when they are in the area. It was interesting watching the super bowl in spanish and teaching Giovanni’s brother in law, Mario about how the game of american football was played. Mario was a crazy cat who worked a marketing job in San Sal but told us about his partying days as he fed us tamales and local beer. 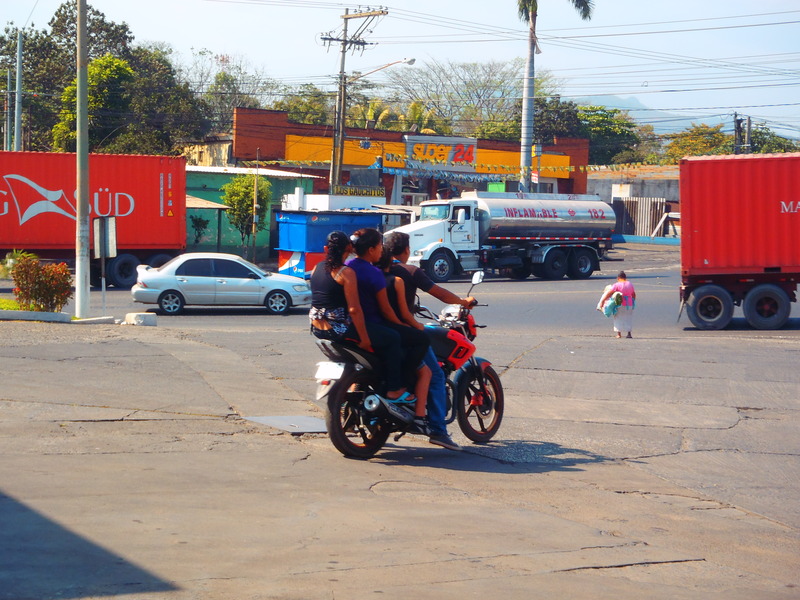 In the USA families of 4 drive in minivans, in El Salvador families of 4 ride motos… There is definitely a different way of living down here! All over the roads there is sugarcane scattered as the massive trucks are over flowing with this high commodity product. The sugarcane grows like weeds down here so you can find it all over the place. The cane is a great snack and an even better source of quick, on-the-go energy! Ike chowin down on some cane! 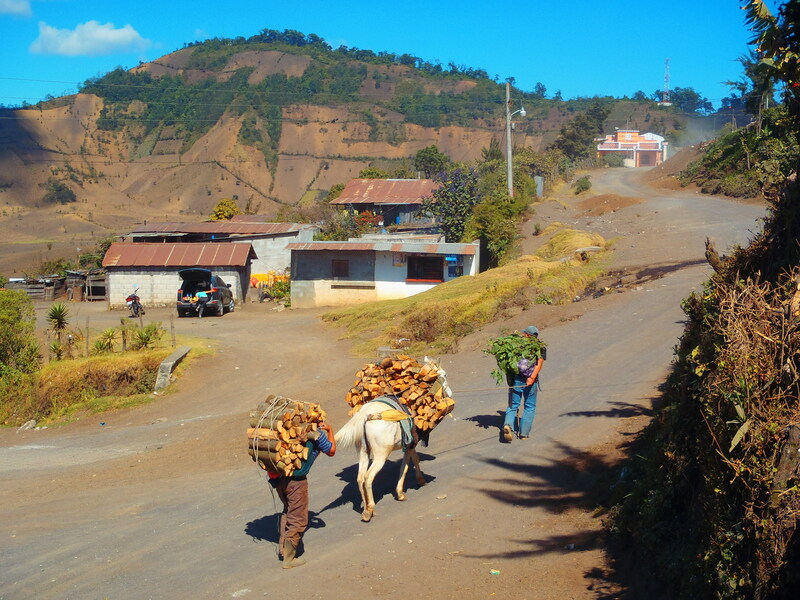 As the Ranger Riders cruzed down to the coast of El Sal we decided to head towards San Miguel. Getting into the hot, muggy city, we found the central park where we just wanted to relax for a bit. After getting in trouble twice for laying in the grass and taking our shoes off, Ike went to look for veggies for dinner. All locals were very unhelpful and merely laughed as he was trying to find a stand that sold something besides bananas. Not finding veggies, Ike returned to kids and adults asking Hen for money. That was the last straw that broke the camels back so we left the city. Searching for a place to spend the evening we camped behind a soccer field in Vidal’s yard. Vidal was very friendly and had cyclists camp at his house 8 months ago he told us. He also was very proud of his green card which he showed us! Vidal works in South Carolina and is psyched to go back in the spring when its not so cold up north! Cool double story shipping container house on the way out of El Sal! The next day was the border crossing into Honduras. It was pretty cool to cross the river and get our passports stamped. A 3$ fee was required for our visas. Right off the bat we noticed the kindness and the comforting Hondurian vibes that the locals were throwing out at us. The riding consisted of dry grasslands and was very desert like with some parts reminding us of the badlands of Baja. Our favorite night in Honduras was the night we met Denis and his friends on the side of the road who invited us into a wooden shack for a beer! They were so excited on our travels that Denis welcomed us to stay at his families house. Full of chickens and small olive like fruit trees, we camped in the dirt yard. Denis’s family was very welcoming and were psyched on our trip. His Grandma Clemencia was very generous as she gave us some pasta sauce and butter. We spent the evening exchanging stories with Denis who was a Honduras cop that has worked in some of the most dangerous places including San Pedro Sula, named the most dangerous city in the world right now. 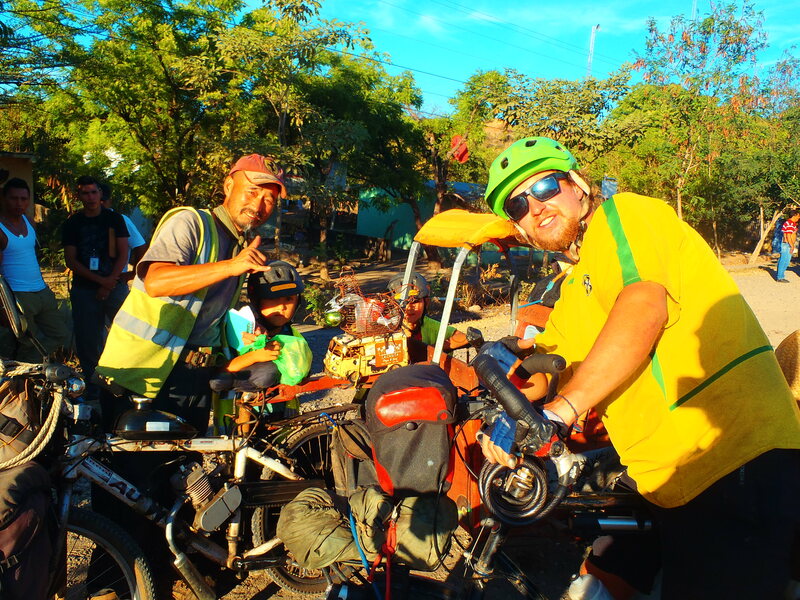 After staying with Denis and his family, Hen’s birthday was getting near and said he wanted to cross into Nicaragua for the big day. So thats exactly what we did. 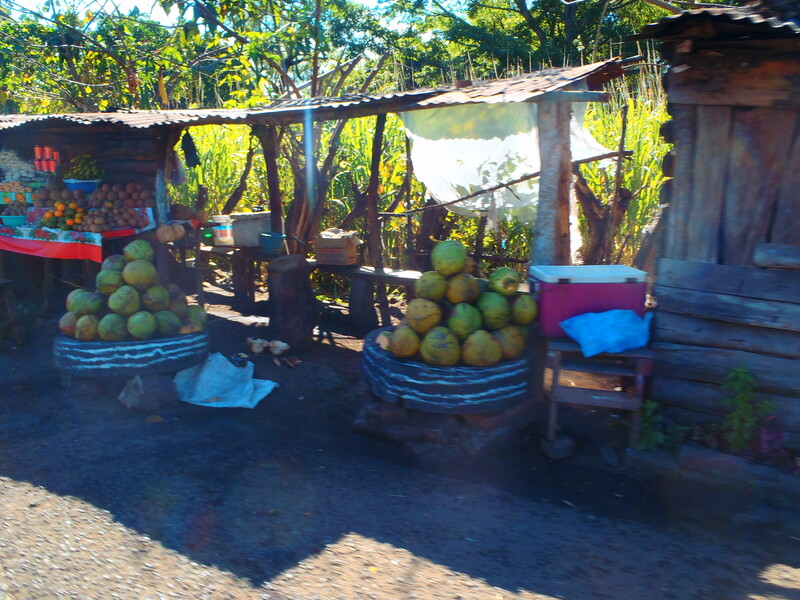 Entering Nicaragua we saw a man with a crazy bike and trailer and had to stop and get his schpiel. His name was Kim and was traveling on a 4 year tour around the world… with his two kids! Starting in their homeland of South Korea he said he wanted his children to experience the “Mundial Experiment.” They had traveled through all of Europe, the Shara of Africa, throughout all of Asia and were on their way to Canada where they would finish before his kids would go back to “real” school. Kim was a very inspirational man and we were super motivated and astonished at his outlook on life. 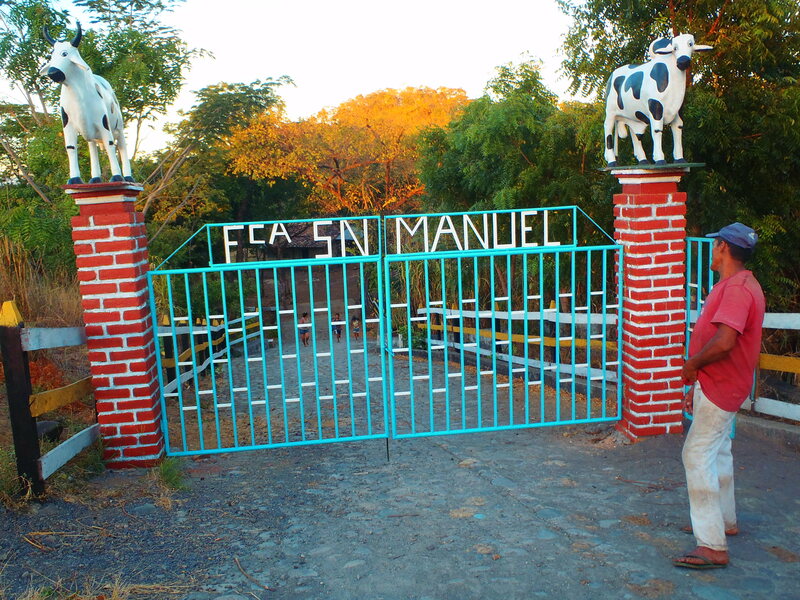 The first night in Nicaragua we stopped a cow farmer, Buanere, next to his gate and told us we were welcome to stay at his ranch. His family cooked us dinner and told us we could help milk the cows before we left in the morning. Milking with Buanere was a great experience as we were able to squirt the milk straight into our coffee from the cow. Doesn’t get much fresher than that! Riding in Nicaragua turned back into jungle with vines spiraling down streetside trees and large iguanas being sold on the side of the road. The scenery changed from farmlands in the foreground to large towering volcanoes in the backdrop. 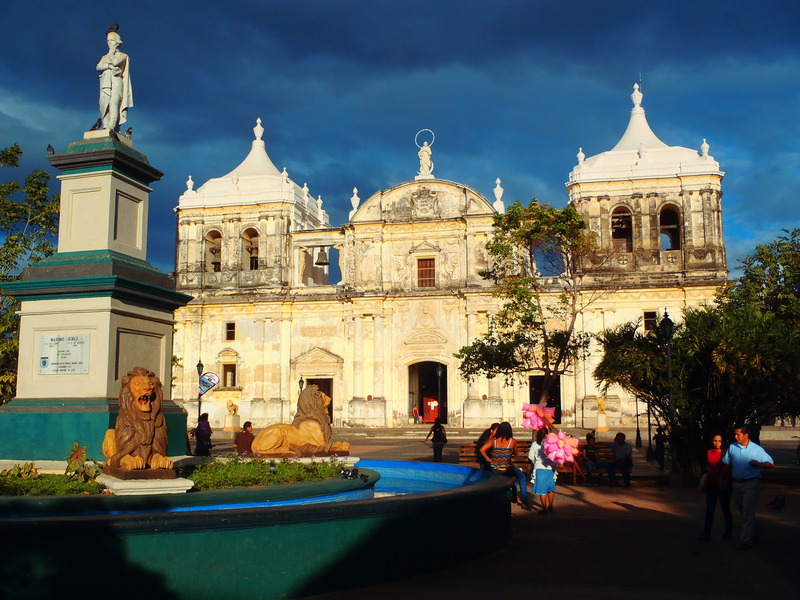 We made it to Leon, Nicaragua after 6 days on the bike and decided to take a day off. 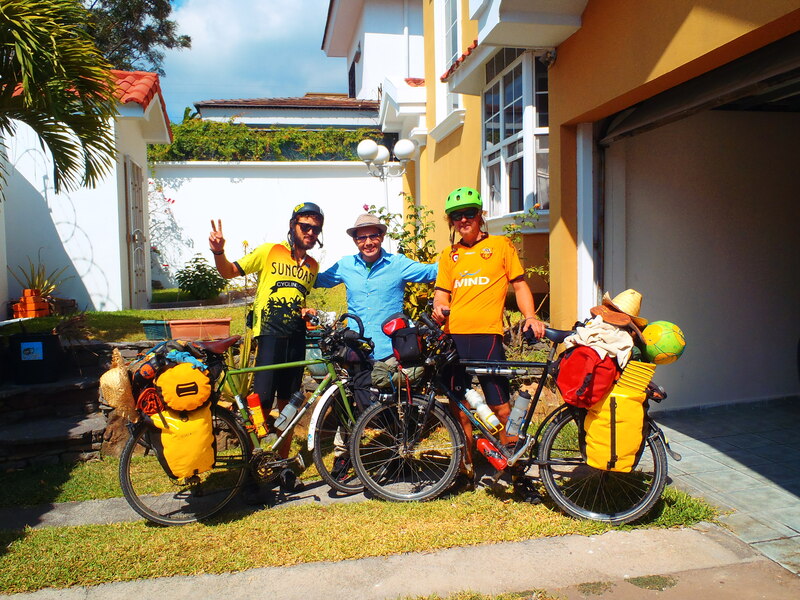 Staying in a local hostal (with free pancake breakfast) we met a professional mountain biker from France, Tito Tomasi, who has traveled the world on with his mountain bike and is now riding all the volcanos in the area. He has his own channel on epictv, which is an infamous series of epic adventure sports that can be difficult to get featured in. 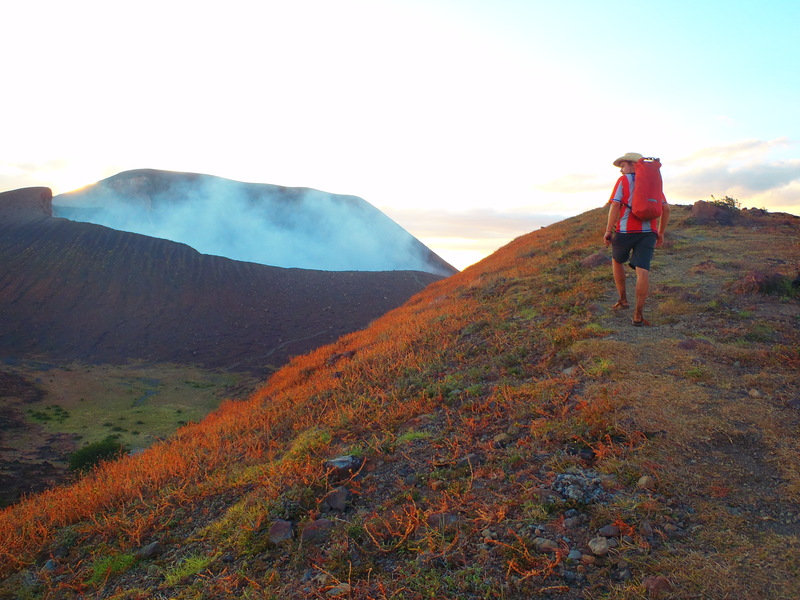 Tito was doing an illustrious volcano climb and we decided to join him and see what the chain of Nicaraguan volcanoes was all about. Once again we weren’t tryna pay the exorbitant tourist fees for volcano trips so we just did some local research on how to do it ourselves. 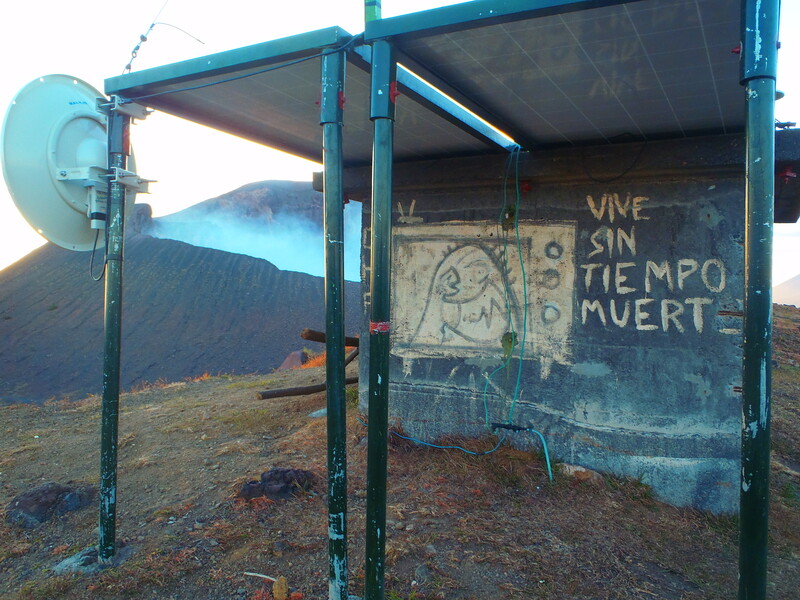 We took a bus from Leon to the small village of San Jacito where the trailhead for the Volcan Telica. Tito mashed up the trail ahead of us on his mountain bike while we slogged up behind planning to meet him on the summit. The hike was pretty cool and not nearly as steep or high as the Volcanoes in Guatemala. After hiking through farmlands for a bit we encountered a spectacular valley. Once we made the approach to the base it turned quite steep for a bit as it switchbacked up the side of the mountain. After a few hours of uphill we made the summit crater just at sunset ! 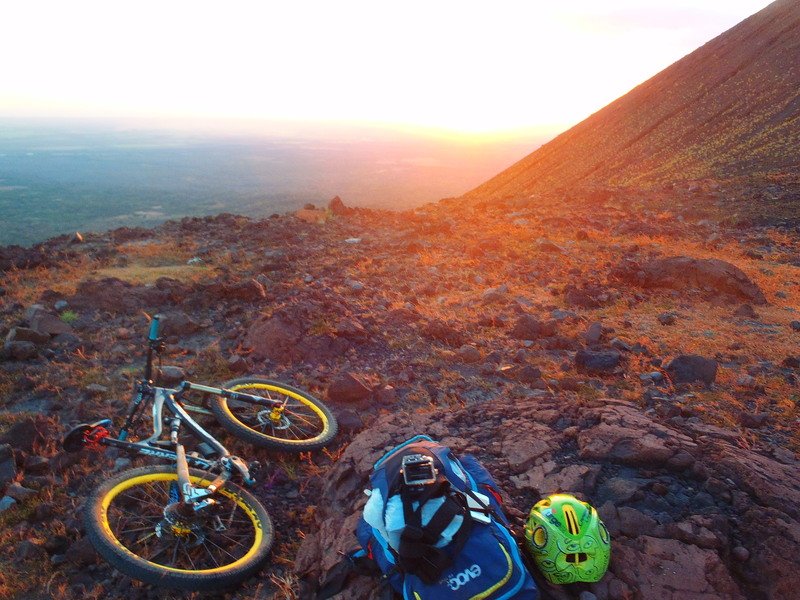 Naturally it was epic as we found Tito up there with his bike enjoying a beer during the sunset. After dark we checked out the massive crater! 700m wide and 120m deep! It was smoking and in the bottom you could see the lava! It also sounded like a jet engine in there roaring! 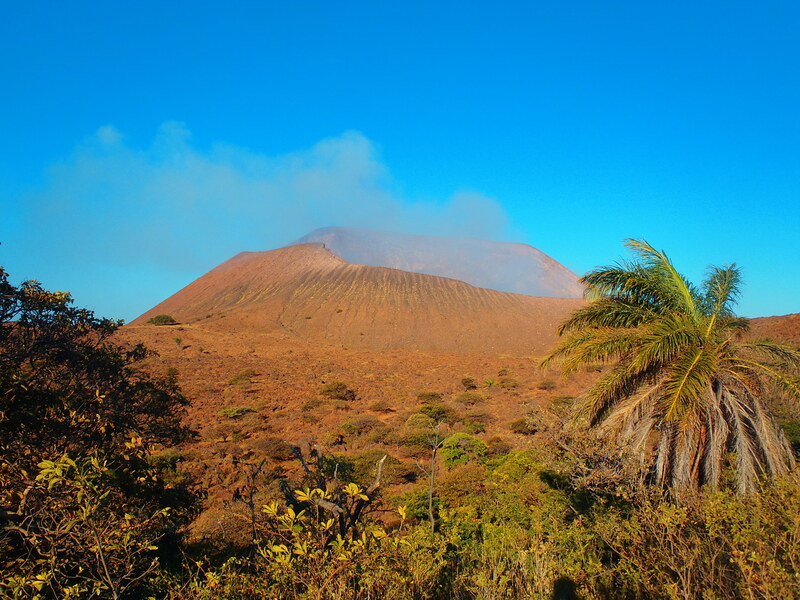 These volcanoes are really exciting to see first hand as it is truly a spectacle! We passed a windy night in the shelter and watched the sunrise in the morning. 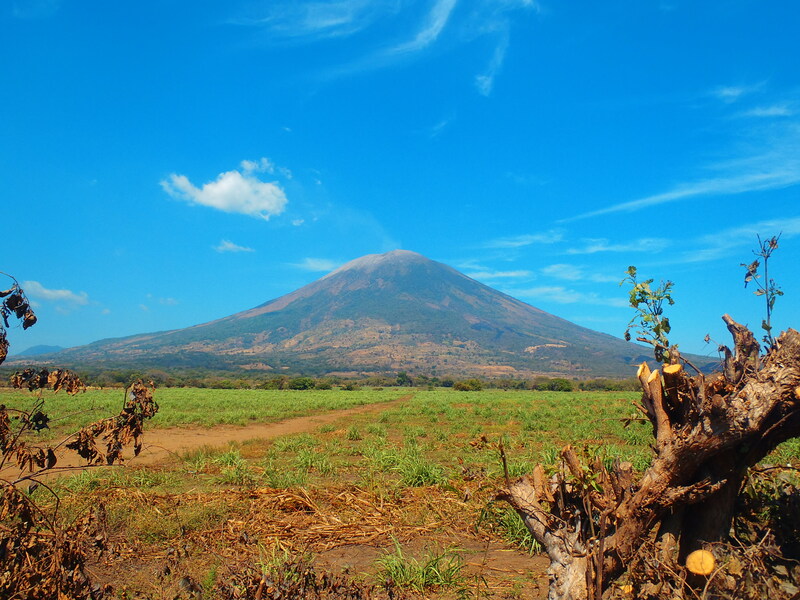 Were off to Ometepe, a volcanic island in Nicaragua Lake, where we plan to spend a few days relaxin, checkin out farms, and going swimming! When the government is good, the villages are happy. 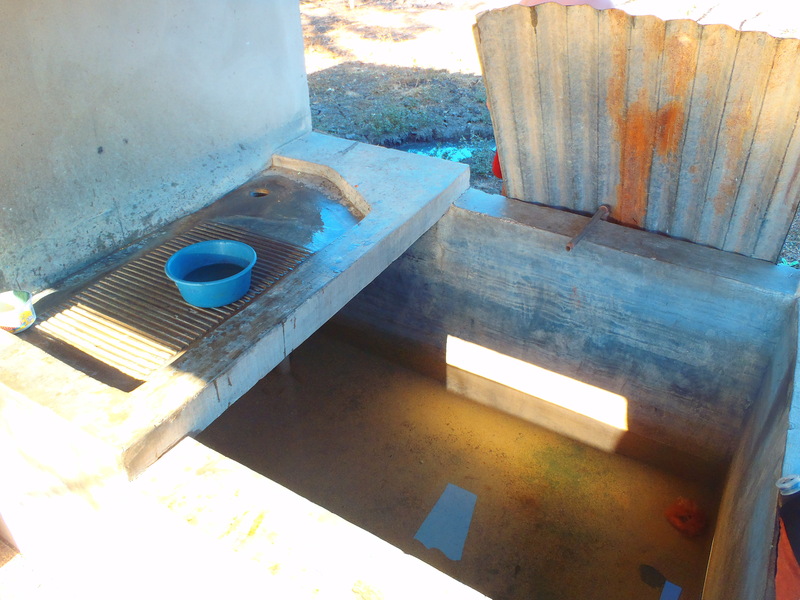 When the government is bad the villages suffer. 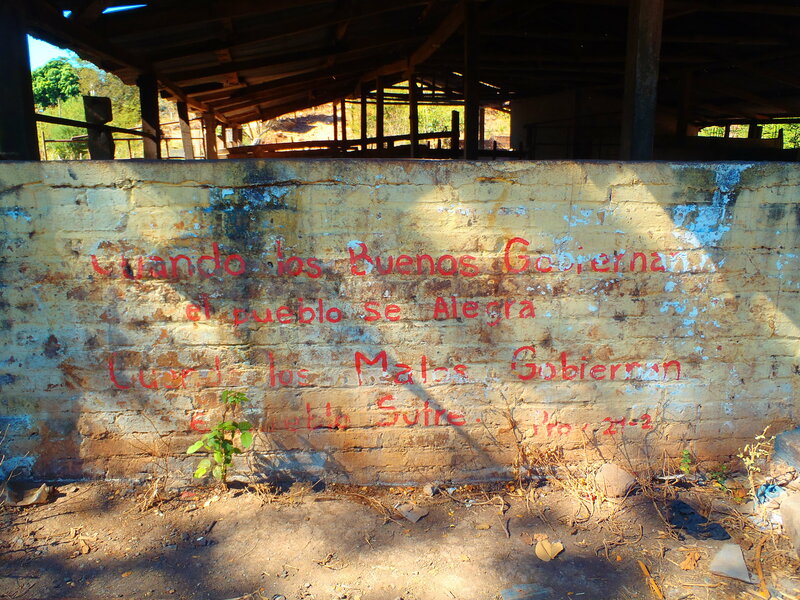 True words from an old farm wall. Awesome time in guate ! czech it out! !